Rooted Childhood April Collection- You've probably seen me post crafts and recipes that we've made thanks to Rooted Childhood. We LOVE using this in our early years homeschool! Meghann from Rooted Childhood will send one lucky winner a digital download of Rooted Childhood's April collection. Butterfly Life Cycle Nature Printables- Tatiana from The Musings Of Mom has these beautiful nature printables that she will send to the winner. Planner- The Musings of Mom is also including a Charlotte Mason planner to this great collection of items! My Little Robins Shop Credit- $15 in shop credit will be given to the winner. 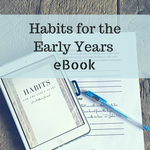 You can choose items for your early years homeschool, or for older children!